The first winter after we adopted Patch was bitterly cold with lots of snow yet he seemed to enjoy exploring the garden and sitting in his hutch though only for a short time. Perhaps he had never seen snow before shut away in a shed for so many years. This is one of our favourite photos of Patch showing how he looked at you when you talked to him or paying him some attention.n. Patch enjoyed sitting in the Sun. First in the morning in the garden than he would come indoors when the sun moved to the front of the house.ouse. 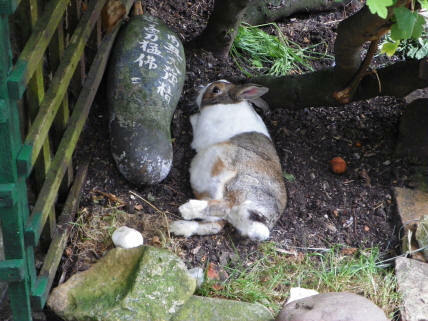 Patch loved to relax in the Garden where he would just flop over on his side. Patch has had his picture painted twice, by myself and a friend. Patch our Dutch rabbit sadly passed away on March 18th 2015 after a long illness, he was about eight or nine years of age and had lived with us for two and a half years. He came to us from a rescue situation where he had been confined in a tiny hutch alone in a dark shed shared with nearly sixty other rabbits all kept in hutches stacked one on top of the other rather like a battery farm. Except this was no farm but rather the garden shed of a person who although well meaning was an animal hoarder. A person who considered that despite the appalling conditions such as green water in the bowls, no exercise or room to move that these rabbits were better off with her than in the situation that they came from. 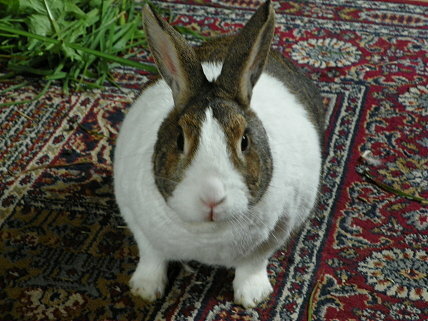 Most were bought to her by people who thought that she was looking after them or most likely didn't care one way or the other as long as they got rid of their unwanted rabbits. Some of the rabbits shared their tiny hutches with a companion but Patch had lost his bonded partner who had died and he was now left alone to spend his days inside this cramped hutch. 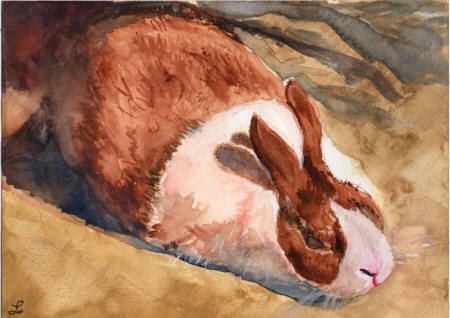 He could no doubt smell and hear the other rabbits but there was no contact, the only other living being he saw was this woman who fed him and provided him with water though by the look of the bowls the water was changed infrequently. He was not even given a name, we called him Patch when we adopted him from the RSPCA. We adopted Patch as a companion for Sooty after she lost her bonded mate Joey but rabbits rather like us do not always get along with other rabbits and despite all our best intentions to bring these two together they never got on and had to be kept separate. Sadly Sooty died some six months after we adopted Patch. It was not long after this that the once healthy Patch went into Gastro intestinal (GI) stasis, a potentially life threatening condition that always needs immediate veterinary attention and must never be ignored. For the first year Patch went in and out of GI stasis but not requiring medication in between times. However at the beginning of spring 2014 things became slowly worse and he never fully came out of GI stasis and he remained on medication, for once it was withdrawn he deteriorated. An X-ray revealed a small swelling in his intestine which was considered benign though it was sore whenever the GI stasis was bad. As the year progressed his medication was increased including pain killers. During Christmas of 2014 he developed sore hocks and needed antibiotics and cream, a couple of months ago he suffered with a significant ear infection and had to have ear drops. About five weeks ago his stomach bloated and needed draining and a stay in hospital overnight. He was lucky to have survived, many bunnies do not and quick action is required. He seemed to improve little and in desperation we decided to try Cisapride a difficult medication to obtain, as it was banned for human use it was not easy to get hold of for animal use. Our vet managed to obtain some and after taking it he seemed so much better, like a young rabbit again. It was like a miracle! Then unfortunately a few days prior to the 18th March he went down hill, the tumour having grown bigger he was now too ill and in a lot of stress and pain and the kindest thing was to let him go. Though he lived without the companionship of another rabbit which is the ideal, he seemed a happy and contented little animal. He loved to be fussed and stroked and would lick your hand or ankles to show affection. He was a good boy and took all his medication, though he never liked being picked up he soon settled in my husband's lap for a fuss and a stroke after I had administered medication and other therapy. He though didn't like his hocks being bandaged and as the bandaged was very loose - a tight bandage would stopped his circulation and resulted in serious problems - he soon flicked it off. I recall one day after bandaging his hock and putting on a little sock how he rushed round to were I was sitting, looking my way, he lifted his bandaged foot and deftly removed his sock and bandage with his teeth throwing it in my direction as if to say I am not having anymore of this. Another incident of note which showed him to be of need of affection was the time he accidentally inhaled water while drinking from his bowl. Poor Patch really was scared and after coughing and forcing the water out of his nostrils, in a state of panic and confusion he rushed over to my husband for a cuddle and some sympathy. He was an intelligent animal, mischievous and playful, though a house rabbit he liked to sit in his hutch even in the winter for a while. He loved foraging in the garden eating the birds' seeds which he should not have done but which was not easy to stop him from doing. In the summer he sat in the sunshine in the garden but knew when the sun moved to the front of the house, as at the correct time he moved into the sitting room to continue enjoying bathing in its warmth. 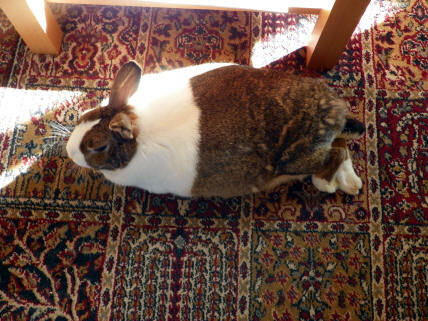 The vets who looked after him during the two years he was ill described him as a very brave rabbit and indeed he was. 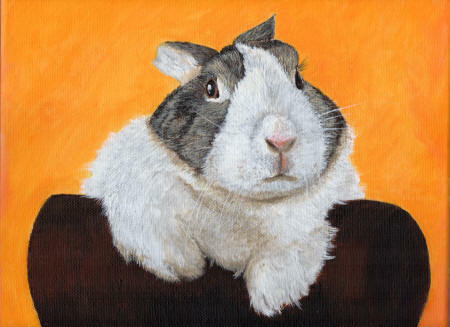 He was a survivor, he had a strong will to live and just when you thought he would not make it through the next round of GI stasis he bounced back. Sadly though the lump seemed to grow suddenly much bigger and he was in great distress and it was time to let him go. A very difficult decision. He is very much missed. He was a little person, a rabbit person with all the intelligence mischief and liveliness of a two year old child until he became too ill to cope any longer. We miss him so much, the house seems empty without him. 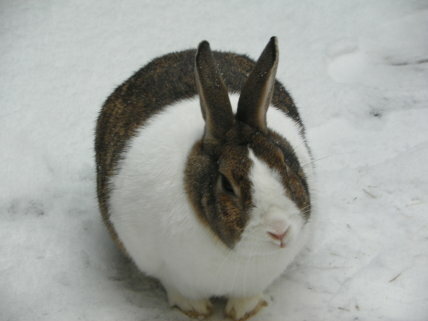 Important Note Gastro intestinal Stasis is a serious life threatening condition and must be treated as a veterinary emergency if your rabbit stops eating or drinking longer than 12 hours, sometimes less.